For many people, there’s nothing better than the company of a good book at any time or place. Among the apps that are displayed in the SilVer Project, we have selected Voice Dream, an app that offers the chance to read books in a variety of formats like PDF, TXT or DOC, and even audio formats such as MP3 or Daisy. Synthetic-voice reading uses high-quality voices, with access to a total of 54 languages; including Catalan, Spanish, English or French. In addition, there is a choice of different male and female voices, whichever the reader prefers. Those with visual problems can no longer say that they have given up reading because they have lost their sight, nor if their eye disease worsens to the point that they cannot read the lettering of a conventional book. 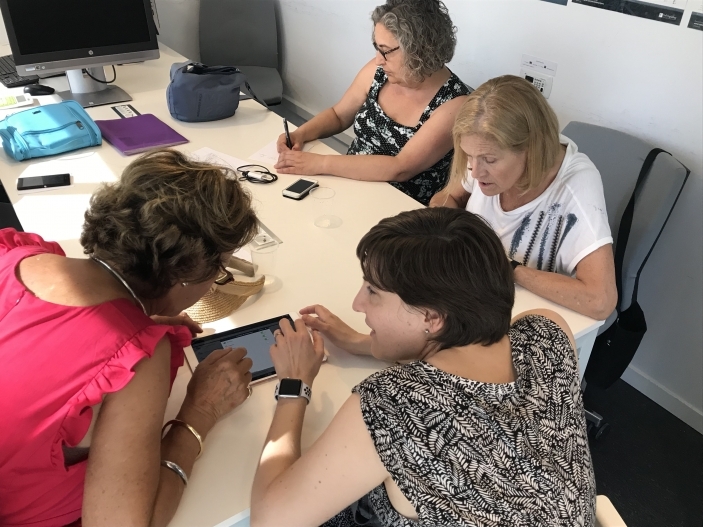 Although it not too difficult to use and download books, the Institut de la Màcula, with the collaboration of the Barcelona Macula Foundation, provides personalised initiation courses. To understand the app properly and make the best possible use of it, we should start by familiarising ourselves with some cloud services such as Dropbox or iCloud, as well as phrases like “drag the file” o “upload to the folder”. Voice Dream is an app that enables books to be downloaded using third-party services and therefore, as it is an open app, the user can select the book according to the format and the location of the file containing the book. To give a practical example: we can find the title of the book ‘The Tree of Knowledge’, by Pío Baroja, in the “books” folder of iCloud or Dropbox; which basically are storage services. Open the Voice Dream app. Choose the service from which the book will be imported (let’s use Dropbox as an example). Find the folder entitled “books” and open it. Look for ‘The Tree of Knowledge’ and open it by clicking on the “download” button. When the download has finished, click on the “back” button and the book will appear in the general view of the main screen. Here, there are two download options: one with the book located in a specific folder in “Apple files” and the other with synchronisation of the app with its folder in the root of the iCloud service. Click on the “add” button (a screen with a variety of options opens). Select “files” and find the folder entitled “books”. Open it. When the download has finished, click on the “back” button. The book will appear in the general view of the main screen. There are many apps that, installed on a phone, incorporate cloud services when they are installed. In the case of Voice Dream, this provides synchronisation by default with the iCloud service; as long as it is installed with an Apple product. When this service is used, a folder in iCloud called “Reader” is created and, within this, two sub-folders can be seen: “Library” and “Loader”, each with its own task. Save the book in the file called “Loader” and release. Once the book has been stored, the folder needs to be closed and the Voice Dream app opened. On opening the app, it synchronises automatically with the iCloud service. After a few seconds, the book appears in the list on the main screen and is available to be read. In the top left, the “add” button can be seen. This is used to add books to the library. The “edit” button. Clicking on this enables, apart from other things, removal of a book that has already been read. The list of saved books is displayed. There are two arrangement buttons: grid and list. Voice Over users are recommended to use the list format as it arranges clearly book titles and details. “Configuration” button. This configures the following: synchronisation with the cloud, content sources (digital libraries), voice management, contact with the developer and the app user guide. “Document” button. This provides options with regard to the book you are reading. These include export in another file extension or the underlining of text whilst reading. “Controls” button. This enables the reading mode to be changed, stopping at the end of the document or sentence, continuing with the next document or finger-reading mode, recommended for those with dyslexia or learning problems. Here, you can modify anything to do with the voice, reading speed, reading language, voice selection, advanced settings, pronunciation settings or entry to the voice store. You can modify the visual configurations of plain or original text, adjust the font in size and spacing, view the interface in clear or dark mode or personalise it according to your needs; together with a variety of advanced parameters. We need to take into account that the app enables bookmarking according to preferences, headings, paragraphs or text as it is a great help if you wish to remember where you have stopped reading. It also does so automatically if you receive or end a phone call the app leaves an automatic bookmark at the point where you stopped reading. There is also the “play” button, which starts the reading of the book. In addition, it provides extensive search possibilities according to time (in seconds), sentence, paragraph or highlights throughout the document. The “search” button can be used to find a word or sentence. Reading time indicators, for the time spent reading or the time remaining to finish a chapter are other Voice Over options.